Add spark to your life as well as those who matter to you with this Yummy Chocolate Collection Gift Basket for him enriched with the flavors of happiness and vibrancy. Show your loved ones that they deserve the best with a Hamper that�s brimming with delicious treat like Handmade Chocolate Box (9 pcs), 2 Cadbury Temptations Rum n Raisins, Dukes Chocolate Rolls and Pringle Chips. 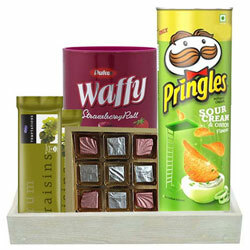 These whole items are presented wonderfully in a Wooden Tray.